Nowhere in the Muslim world can you find such a profusion of domes and minarets as in Cairo. Rising from the haze of crowded, crumbling streets in the old, chaotic, yet picturesque medieval parts of the city, they dominate the city's skyline. Minarets, indeed, are Cairo's joy and ornament and the source of Cairenes' favorite nickname: "Madeenet el alf Midhana," "the city of a thousand minarets." Absolutely stunning pic!! One of the best I've seen. Is this image a real photo, or did you photo shop a number of different images together? Wonderful :) This became my wall in about ten seconds! The colors and composition are great. The photoshopping is good (duplication is rare and elements are, in most cases, well defined), but it still needs a some work. There are some perspective problems here and there (the most obvious being on the bottom of the biggest minaret). Also, the way the water on the left fades into the city looks awkward in comparison to the general quality of the rest of the picture. Still, the choice of imagery is very good and the HDRI look you gave it is pretty convincing. 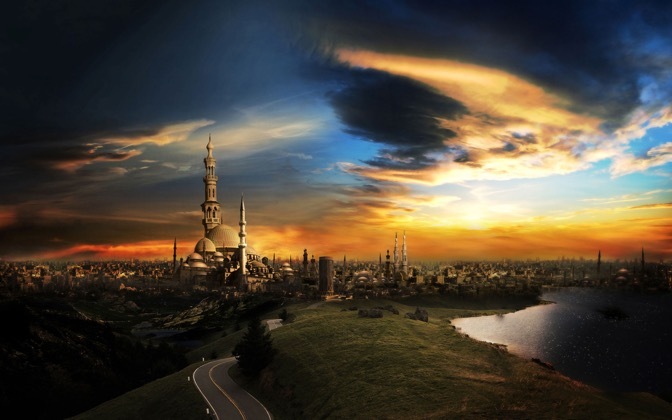 The Muslim world is almost never portrayed beautiful, i find this to look amazing and snagged a spot on my desktop. Great work! One of my favorite wallpapers ever! Simply breathtaking! Simply awesome.......It's my favorite of all time. Overall this images does lend well as a wallpaper. It is colorful and dynamic with the exotic architecture and the dramatic lighting that is being cast onto the sky. In general less is more, the color is perhaps too artificial in the sky and give the image an uber-reality, sci-fi quality.